Left to Right: Jennifer Wheeler, Membership Coordinator, Cookeville-Putnam County Chamber of Commerce; Matt Manzaro, General Manager, TTU Golden Eagle Golf Club; Brandon Parrish, Chamber Golf Committee; Dianne Callahan, VP Member Development, Cookeville-Putnam County Chamber of Commerce; The Chick-Fil-A Cow; Ian Robson, Chamber Chair Golf Committee; Angela Regitko, Chamber Golf Committee; Nathan Morgan, Chick-fil-A. 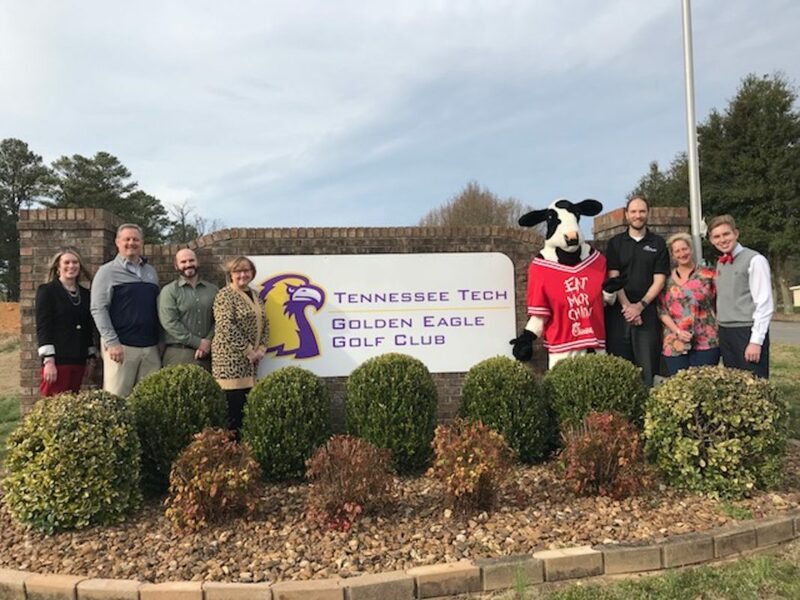 COOKEVILLE – The Cookeville-Putnam County Chamber of Commerce’s 12th Annual Membership Golf Tournament is Friday, May 24, at Tennessee Tech Golden Eagle Golf Club. Chick-fil-A will serve as title sponsor. The tournament will be a two shotgun, four-person scramble format. Cost for each team is $450; this fee includes practice round, range balls, putting contest entry for each player, golf cart signs and lunch. The day will consist of two rounds with a cap of twenty teams each. Slots are available on a first come, first served basis. Breakfast will be served at 7 a.m. with the first shotgun at 8 a.m. After the first round, lunch follows at noon with the second shotgun at 1 p.m. Awards and rankings will be announced on the chamber’s social media, followed by local media. Awards will be available for pick-up at the chamber the following week. Forms are available at the chamber or by contacting Membership Coordinator Jennifer Wheeler at (931) 526-2211 or JWheeler@CookevilleChamber.com. Registration forms are due on or before 4 p.m. Friday, May 10. The Cookeville-Putnam County Chamber of Commerce aims to develop and maintain an economic climate that creates and retains jobs and enhances the quality of life for all citizens of Cookeville and Putnam County.